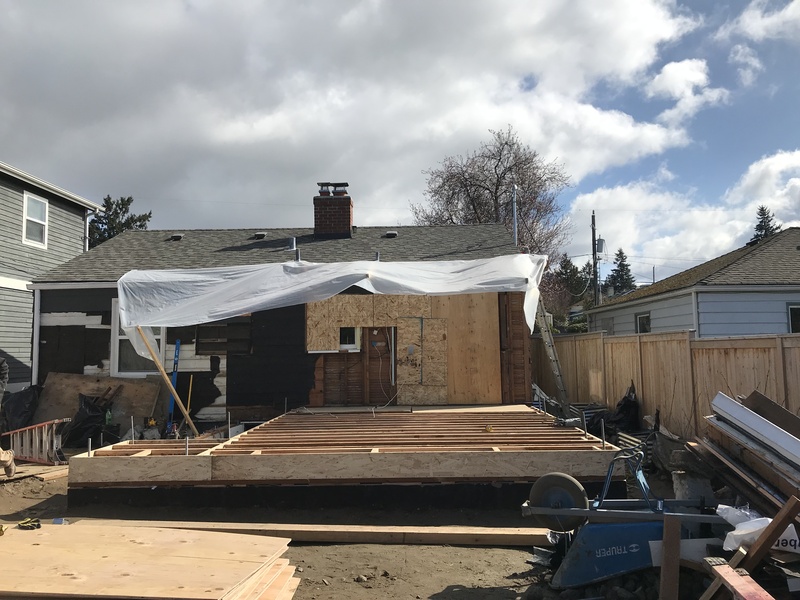 We are excited to announce that Mighty House Construction will be featuring TWO projects on this year’s Northwest Green Home Tour. 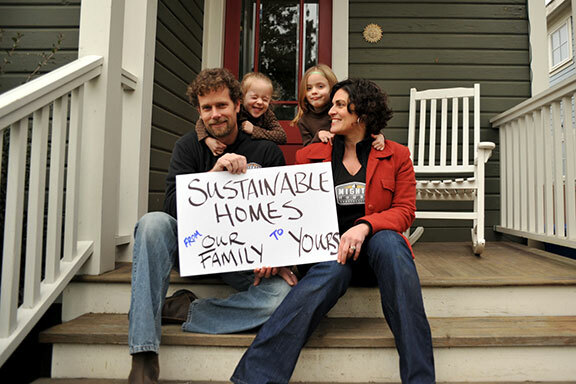 Join us for the event of the year and a chance to tour sustainably built homes and businesses all over the Seattle Area. 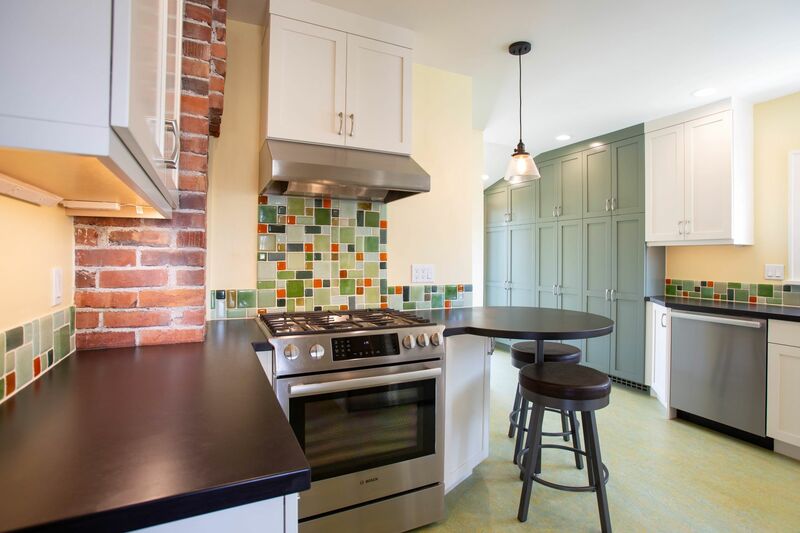 Get inspired by projects in all shades of green, from backyard cottages and kitchen remodels to new homes built with cutting-edge green features. You’ll see and learn first-hand how your neighbors are generating their own electricity with solar panels, lowering their energy bills with insulation, and creating healthier home environments for their families with better building materials and systems. Learn from experts and really understand “what makes it green” on this educational tour. Mighty House will have one project open Saturday, and one project open Sunday. Check them out below! OPEN SATURDAY ONLY – A typical 1940s war box home, has gotten just a little too cramped for this family. 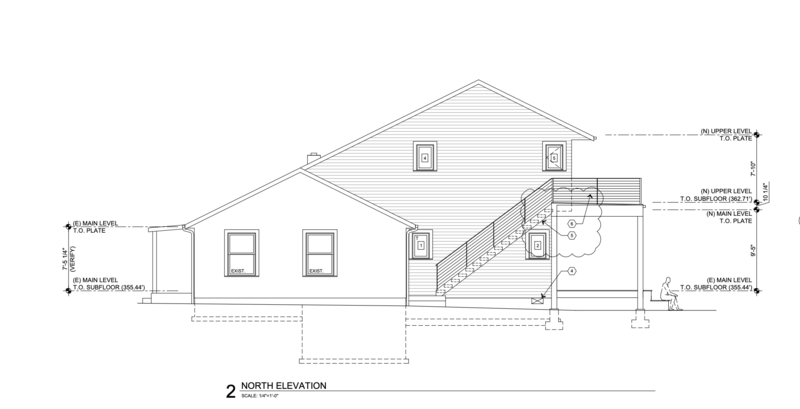 Designed by Leo Smith Architect, this West Side Second Story will add a dining room off the kitchen on the backside of the house with a 2nd-floor master suite above. Currently IN PROGRESS, this is a great opportunity to see behind the walls and the sheetrock stage of the addition. This project features advanced insulation, healthy materials and infrared radiant heat. 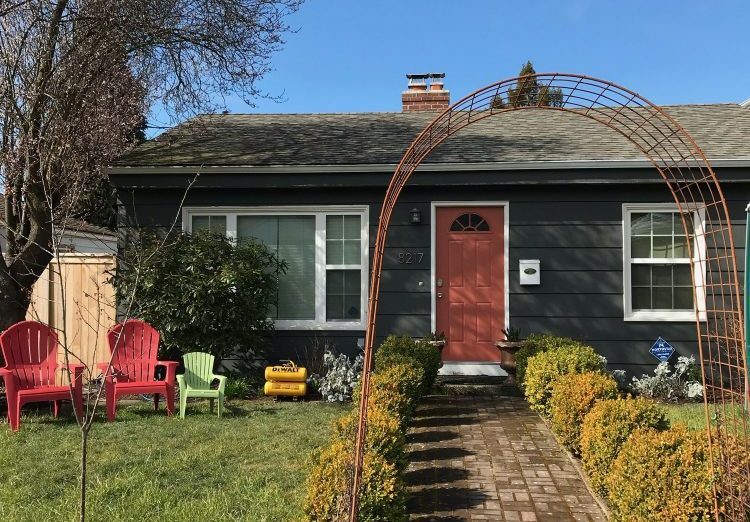 See how this family is gaining just enough square footage, with minimal scope creep, plus a stellar view of tree canopy and the Puget Sound! Read more here. 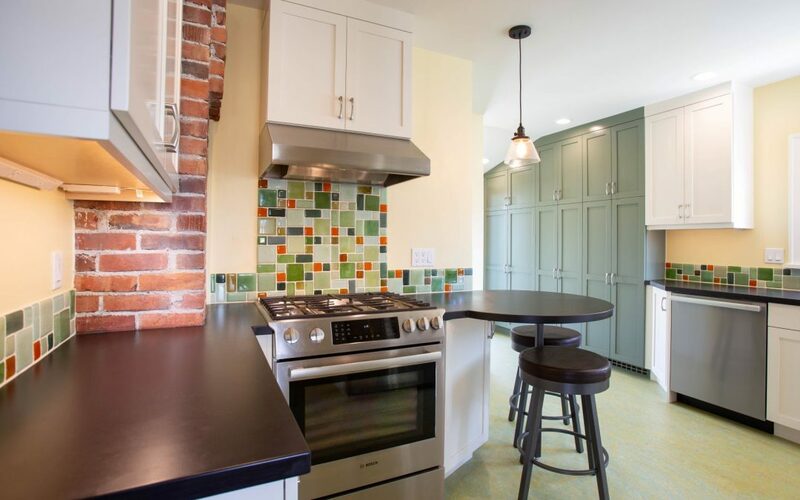 OPEN SUNDAY ONLY – The kitchen of this 1925 Ballard home was well-used, worn out and and in need of some serious love and upgrades. Mighty House Construction and Entero Design to the rescue! The existing kitchen layout was semi-functional but not super-functional, so Entero recommended acquiring the back porch space into the kitchen. This allows for increased storage, better all around functionality, and a space for the family to gather together. Read more about this project here. Join us May 4 and 5, 2019 from 11 AM to 5 PM | Get Tickets Here! 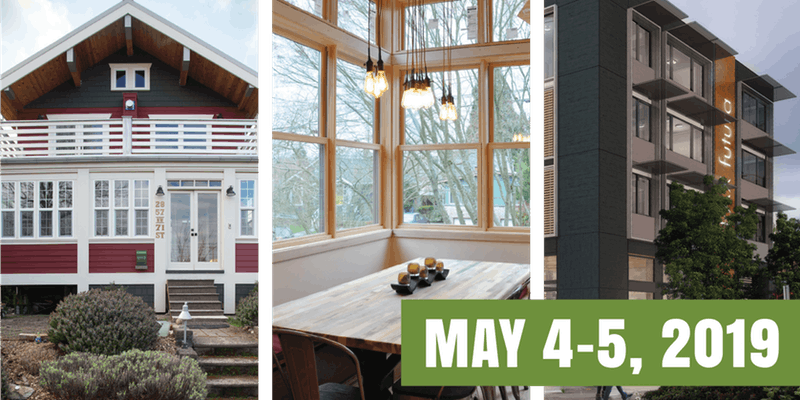 May 5, 2019 on the the Northwest Green Home Tour! This family was unhappy with the layout of their existing kitchen. 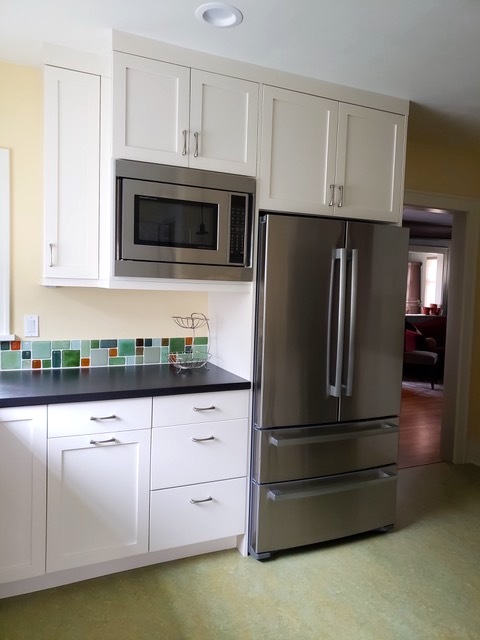 They needed a new kitchen that encouraged social cooking within the family, better storage solutions, and more counter top space. The goal of the project was to create a space where, while one person cooks, the other can occupy the same space to keep each other company. Through the collaborative efforts of Entero Design and Mighty House Construction, we worked within the existing footprint of their kitchen to create a space that fit their design aesthetic and their personal needs. Entero Design worked with the clients to develop a kitchen layout that encouraged socialization between the couple and incorporated a variety of sustainable finishes and materials to make the space unique. To gain more kitchen space, the unconditioned back porch was enclosed and incorporated into the kitchen space, enlarging the kitchen by a few feet. Mighty House Construction handled the construction process for the project. We were able to keep the pre-existing exterior stairs and reuse the interior kitchen doors. 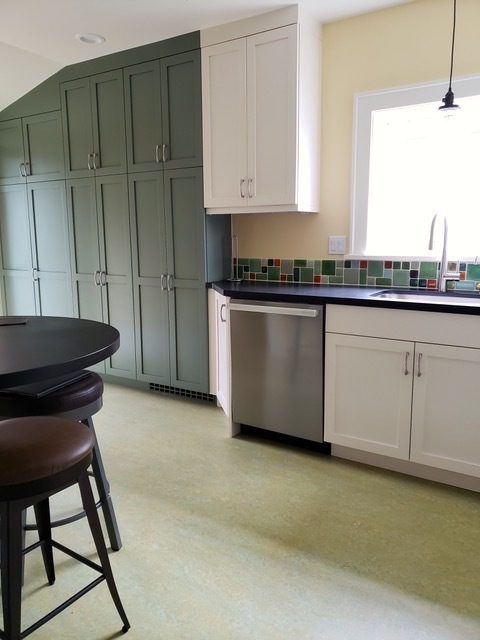 The old flooring was replaced with Marmoleum, a natural linoleum made from linseed oil and mixed with other natural products on a jute backing. 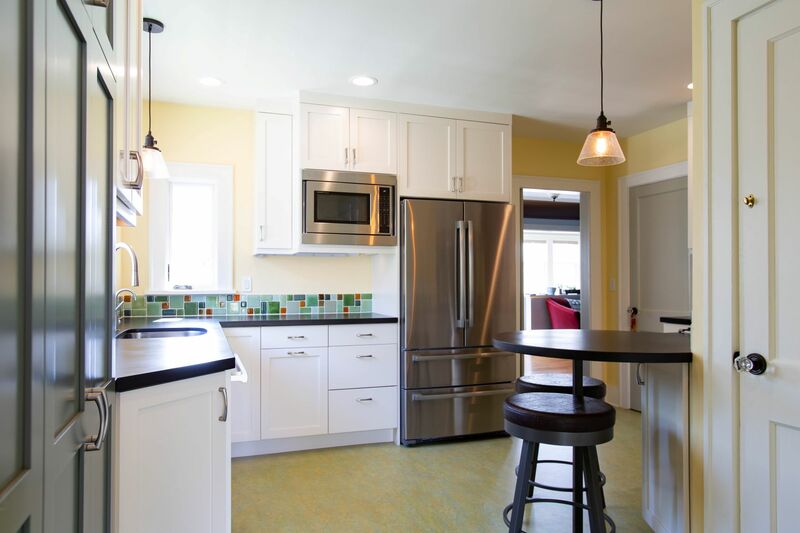 The new counter tops are made from Paperstone, a solid surface counter top made from recycled paper, and the newly installed cabinets are from Canyon Creek, a local cabinet company in Monroe, WA whose wood products are Carb2 compliant. 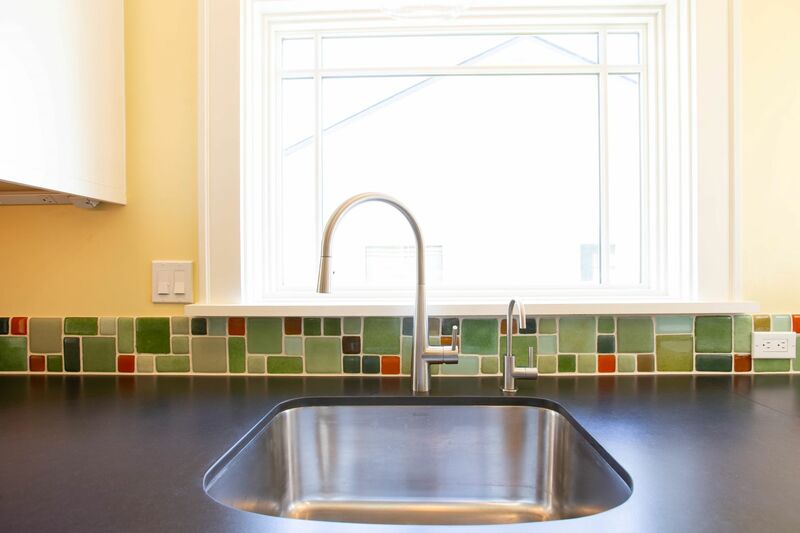 The beautiful new back-splash features Bedrock Recycled Glass tile made in Seattle from 100% recycled glass product. The space also features newly installed LED overhead lighting, and under-cabinet lighting from Northwest LED. We can’t believe a whole decade has passed! This picture was taken just about six months after the company started; the *wondertwins* were in preschool and are now in 7th grade! We are endlessly grateful to all our customers that allow us to shine and our trades partners that help us do so. As would be expected, the number of ebbs and flows the company has endured and enjoyed is extensive. Though the one constant force has been and continues to be our unyielding dedication to bringing solutions that result in happier, healthier, more sustainable homes. Doug, Laura, and the whole Mighty House team look forward to the next 10 years of creating small and large shifts that improve how families live, play, and grow in their home. Cheers! Every year Mighty House makes an anniversary donation as one initiative towards supporting the greater community. This year we focused that donation to the Low Income Housing Institute of Seattle. 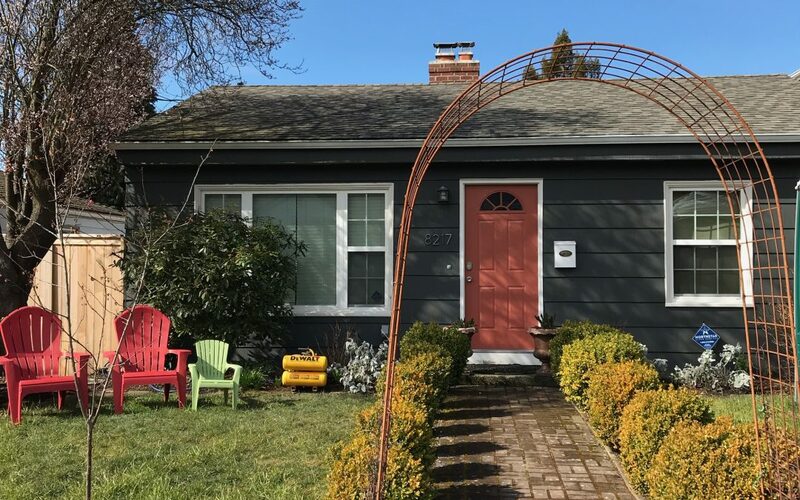 Over the past several years LIHI has developed nine tiny house villages in Seattle and more recently, are in Olympia. Together they will serve approximately 1000 people annually – including familites with children as well as individuals – with housing and services to help the community more out of homelessness. 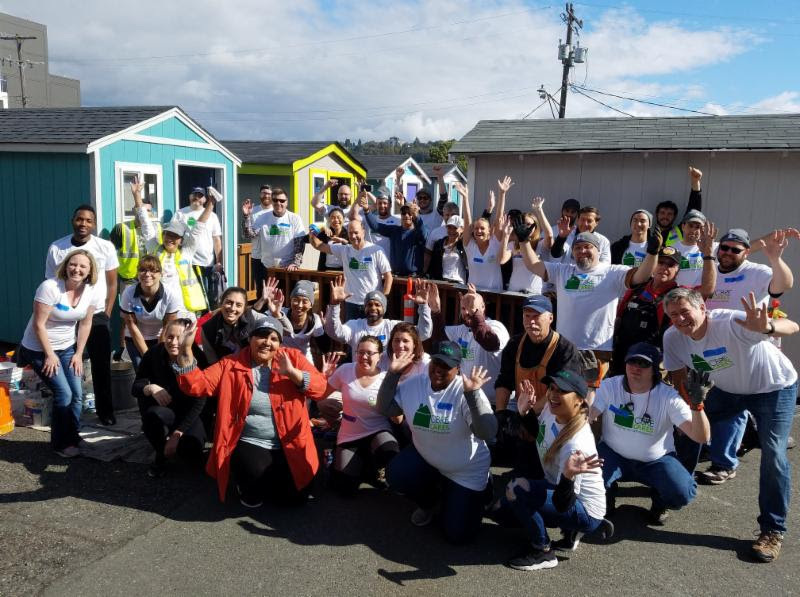 LIHI is currently raising matching funds for their Tiny House Village Program through USA’s Today’s “A Community Thrives – CrowdRise Campaign”. If this campaign is successful, LIHI will become eligible for a grant between $25,000 and $100,000 to continue their incredibly impactful work addressing the homeless problem in our region.